Not to be a contrarian, but the standard deli-issued potato salad isn't really my thing. 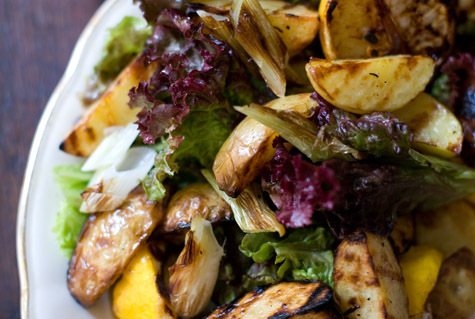 Potatoes as the center-point of a salad? Sounds great, I like the general concept. But all the mayo and mush you get with many American potato salads I can do without. I thought a grilled potato salad might be a fun alternative. My game plan: throw as many of the salad ingredient as possible on the grill, whip up a simple vinaigrette, toss and enjoy. The first decision I had to make was how to cut the potatoes - slices vs. wedges battled it out in my brain. Coin-shaped slices would cook more quickly. Wedges, well who doesn't love a potato wedge? And I knew they'd hold up better. I went the wedge route. Aside from the dressing and lettuce, I arranged everything else on a medium-hot grill - pattypan squash, green onions, halved lemons, and the potato wedges. I tossed the potato salad components with a rice vinegar finished with barely a hint of toasted sesame oil this time around, but I couldn't help but think about all the different ways you could approach this. For those of you who enjoy the hedgehog potatoes (from SNC) as much as I do - I'm itching to try a creamy version where I'd toss these potato with the same yogurt mint dipping sauce I use in that recipe. Or, I bet a harissa vinaigrette would lend nice color and flavor and go well with the grilled potatoes. Or, or, or - I think its tough to go wrong here...If you have a unique twist on potato salad, give it a shout in the comments. When I went to grill the potatoes and squash I set each piece on the grill, I suspect you could also use one of those grill baskets with success as well. I also though about finishing this version with chopped jalapeno, cilantro and toasted sesame seeds - you can make it as simple or embellished as you like, depending on your individual tastes. I used a red-leafed lettuce here. Toss the potato wedges, squash, and green onions with a bit of olive oil and a pinch of salt. Place them on a medium-hot grill. Place the lemons on the grill as well, cut side down. Grill for 10-20 minutes or until golden and cooked through - moving around the grill if needed and flipping to get color on all sides. 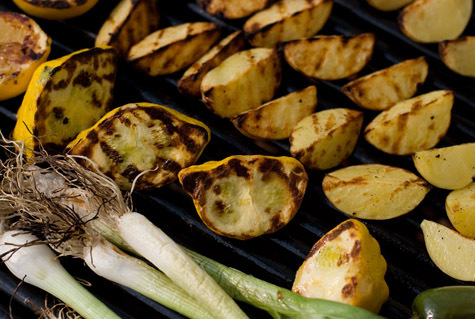 The squash will likely cook faster than the potatoes, remove pieces and place on a platter when they are done grilling. While everything is grilling, whisk together the rice vinegar, olive oil, garlic, sesame oil, and a couple pinches of salt. When the onions come off the grill, let them cool for a couple minutes and then cut into 1/2-inch segments. Set aside. Toss the lettuce with a splash of the dressing, and turn it out onto a large platter. Now toss the vegetables (but not the lemons) with a big splash of the dressing and arrange it on top of the lettuce sprinkled with the reserved grilled green onion segments. Garnish with the lemon (which I like to squeeze over my salad just before eating for an added layer of extra mellow tang that goes great with the potatoes. Serves 6 (or so) as a side.